1. Entries for advance bill should be made in red ink. 2. 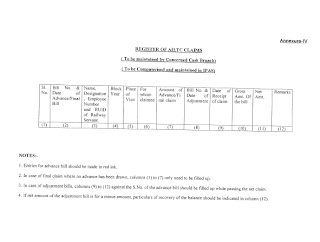 In case of final claim where no advance has been drawn, columns ( I ) to (7) only need to be filled up. 3. In case of adjustment bills, columns (9) to (12) against the S.No. of the advance bill should be filled up while passing the net claim. 4. If net amount of the adjustment bill is for a minus amount, particulars of recovery of the balance should be indicated in column (12).